Former Labour Prime Minister Gordon Brown slams current Labour leadership, accuses party of 'letting Jews down' on anti-Semitism. 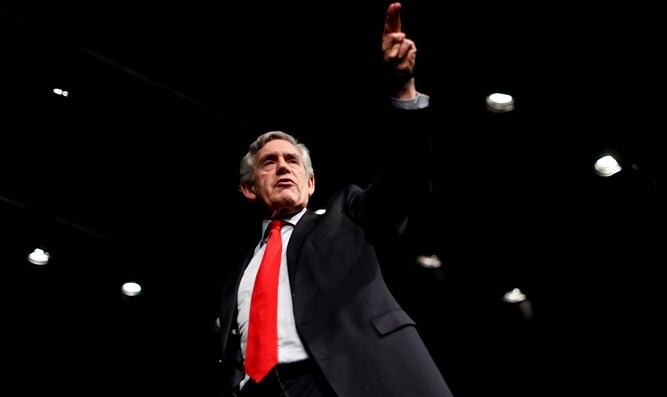 Former British Prime Minister Gordon Brown, a member of the UK Labour Party, took Labour to task Monday, accusing his own party of failing to confront anti-Semitism. In a video message released by the group ‘Hope Not Hate’, Brown endorsed the Jewish Labour Movement, and accused the leadership of the Labour Party of failing to combat anti-Semitism within the party, saying Labour had ‘led the Jewish community’ down. “In the last two years the Labour Party has let the Jewish community and itself down. They should never have allowed legitimate criticism that I share, of the current Israeli government to act as a cover for the demonization of the entire Jewish people,” Brown said in the video message Monday. “Solidarity means standing up with those who are under attack and that is why I am joining as an affiliate member of the Jewish Labour Movement and I urge all my colleagues to do the same. “Tackling anti-Semitism, racism and fighting for equality is not a diversion or a distraction from the purpose of fighting for my party, it is the purpose of my party. We will never allow evil to triumph over good and neither will the British people. “No if, no buts, no qualifications, no caveats. It is an understanding that discrimination that starts with one minority never ends with one minority. Brown’s comments Monday come following wide-spread criticism of former London Mayor and ex-Labour MP Ken Livingstone, who recently defended Labour from charges of anti-Semitism, saying it was “not anti-Semitic to hate the Jews of Israel”. Livingstone spoke at a meeting dubbed “Labour Against the Witchhunt” – a mostly pro-Corbyn gathering of party members and supporters who reject claims the party has failed under current party chairman Jeremy Corbyn to properly address anti-Semitism. Corbyn himself has been accused of anti-Semitism over his long history of support for anti-Israeli terrorist groups, his opposition to the adoption the International Holocaust Remembrance Alliance (IHRA) definition of anti-Semitism, and allegations he worked to cover up anti-Jewish incidents within Labour. A 2018 poll conducted on behalf of The Jewish Chronicle found a whopping 86% of British Jews believe Corbyn is anti-Semitic, compared to just 1.72% who believe Conservative Prime Minister Theresa May is anti-Semitic.